For the frugal gamer. 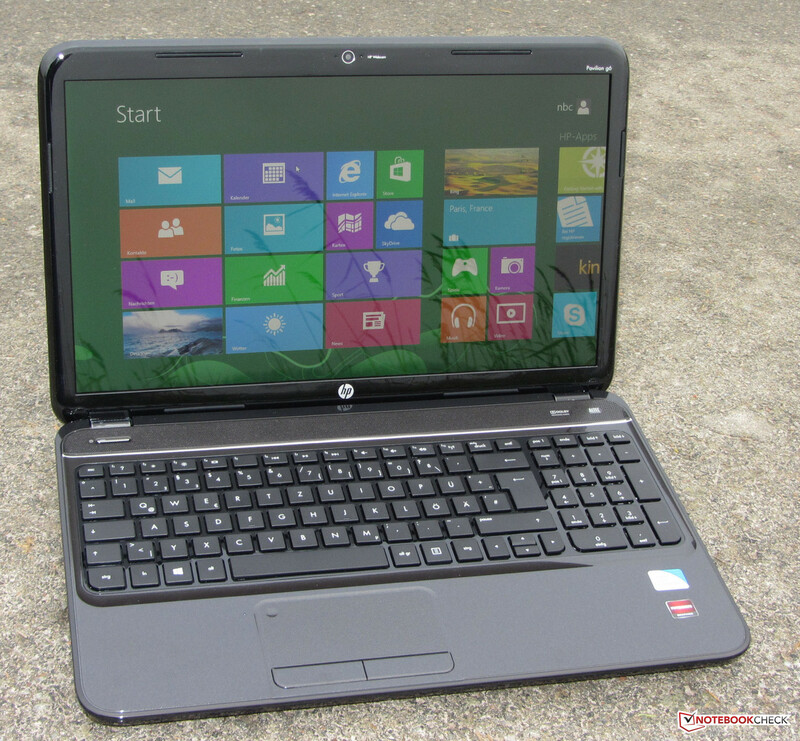 A Pentium processor and a Radeon HD7670 GPU gives you a cheap laptop. Our review reveals whether this notebook is a good buy or not for the cost-conscious gamer. 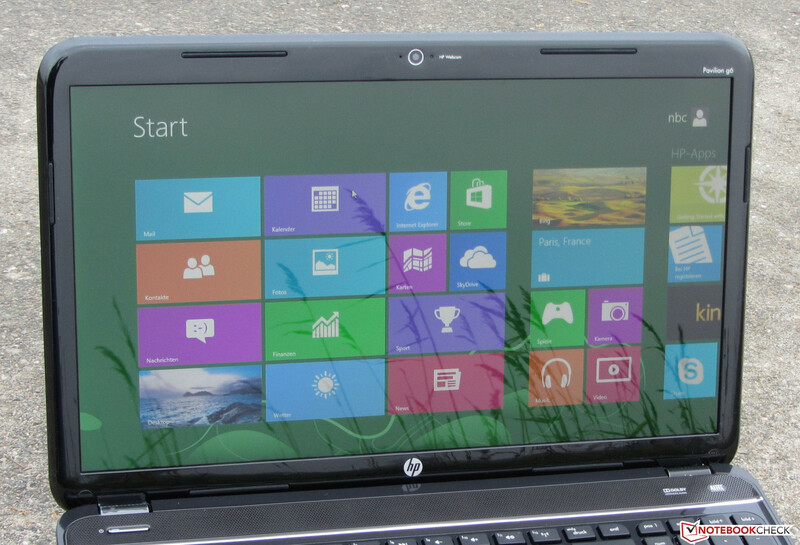 A new 15.6-inch model form HP's Pavilion product line-up entered our labs. 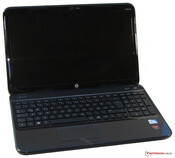 HP equipped it with an Intel Pentium B980 dual core CPU, an AMD Radeon HD 7670M GPU and 6 GB of RAM. On paper, this should result in a cheap, gaming-capable laptop. Our test reveals if this is actually the case. We use the following competition against the HP to determine its gaming worthiness: Acer's Aspire V5-571G (Intel Core i5-3317U, Nvidia GeForce GT 620M) and Samsung's NP355V5C-S05DE (AMD A6-4400M, AMD Radeon HD 7520G + HD 7670M Dual Graphics). 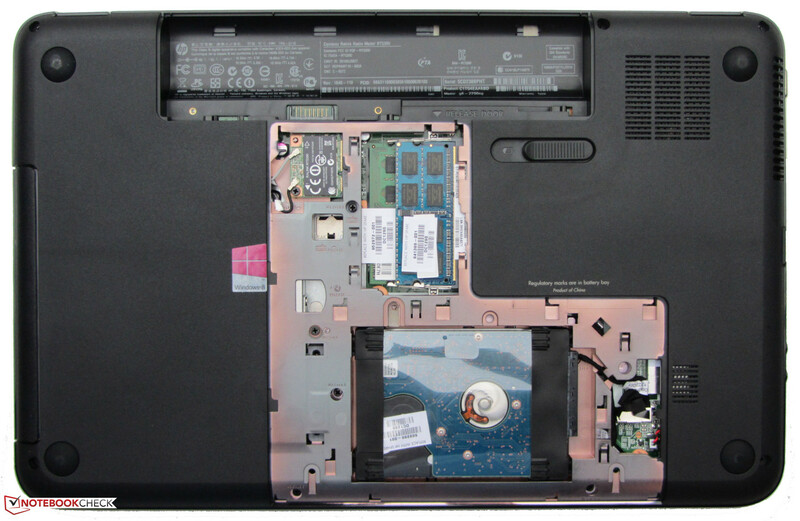 Just like in the case of the Acer Aspire V5-571G's and the Samsung NP355V5C, the entire laptop is made of cheap plastics. However the two mentioned duo use matte surfaces while the Pavilion uses glossy ones. The color of the notebook is called Sparkling Black as the surfaces sparkle in various colors when light falls on them. Generally, the stability of the case is satisfying. It is just the keyboard and the palm rest areas (above the DVD burner) that are slightly unstable and give under pressure. While the base unit can hardly be twisted, not much effort is needed to deform the lid. 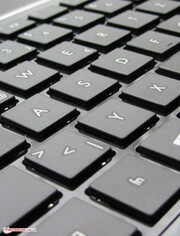 The connectivity available on the three laptops are almost identical. The computer from Samsung has one more USB port than the others. All laptops offer at least one USB-3.0 port. 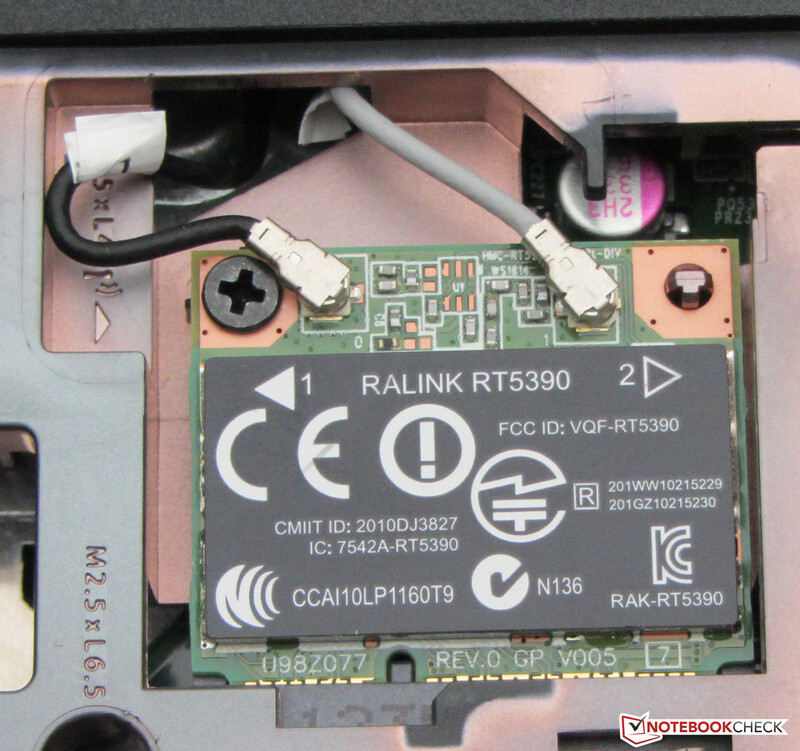 Our test sample is equipped with the RT5390R WiFi module from Ralink which supports the standards 802.11 b/g/n. To our surprise, HP only use a Fast Ethernet chip from Realtek for wired networks. 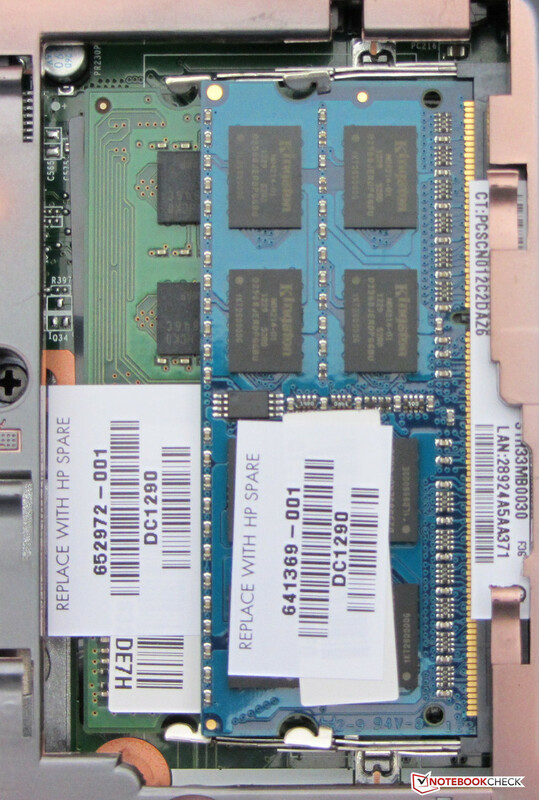 In 2012, we'd also expect GigaBit Ethernet in all low-cost devices and the competition from Acer and Samsung have them. As the Pavilion does not have a Bluetooth module, you will need to use a Bluetooth dongle if needed. But, it comes with a built-in web camera. In the shipping box, there are the usual accessories that include a quick start guide and several small booklets with safety instructions and warranty information. 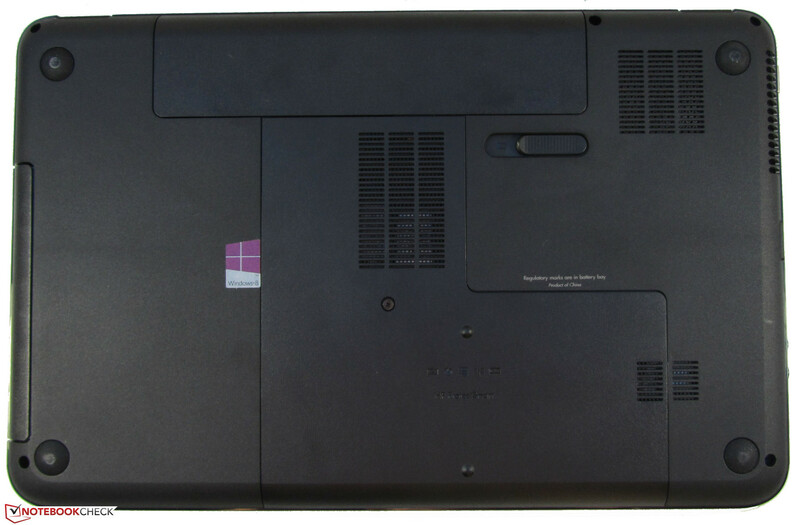 The Pavilion g6-2200sg comes pre-installed with Windows 8 (64 Bit), but an installation DVD is not included and is pretty common in the industry. 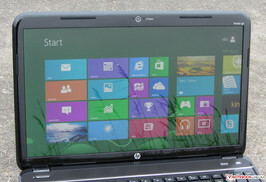 The Recovery DVDs are done via HP's recovery system, which is launched by pressing F11 at boot. Please note that the process will delete all data created and applications installed by the user. 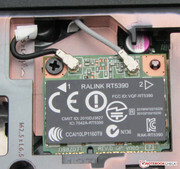 The RAM, hard drive and WiFi module are hidden behind a service hatch. However, the fan is not accessible. 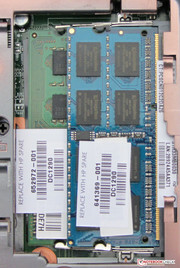 The Pavilion has two RAM slots and supports up to 8 GB RAM and comes standard with 6 GB RAM. 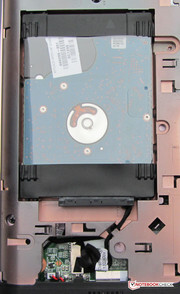 The hard drive can be replaced in a few steps. 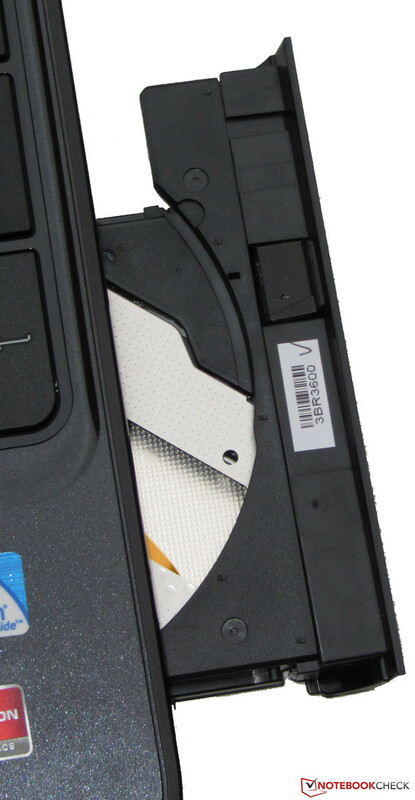 Attention must be paid as HP uses a hard drive which is 7 mm high while conventional hard drive are 9.5 mm thick. HP grants a pickup & return warranty of 12 months for the Pavilion. In case of disrepair, the notebook will be picked up at the user site and brought back afterwards. Samsung and Acer grant a 24 month warranty for their computers. But, the warranty of the g6-2200sg can be upgraded. HP offers two Care Packs. A pickup & return warranty of 3 years that costs 95 Euro and adding accidental damage protection will raise the total price to about 140 to 170 Euro. Spilling a drink over your laptop is an example for an accidental damage. 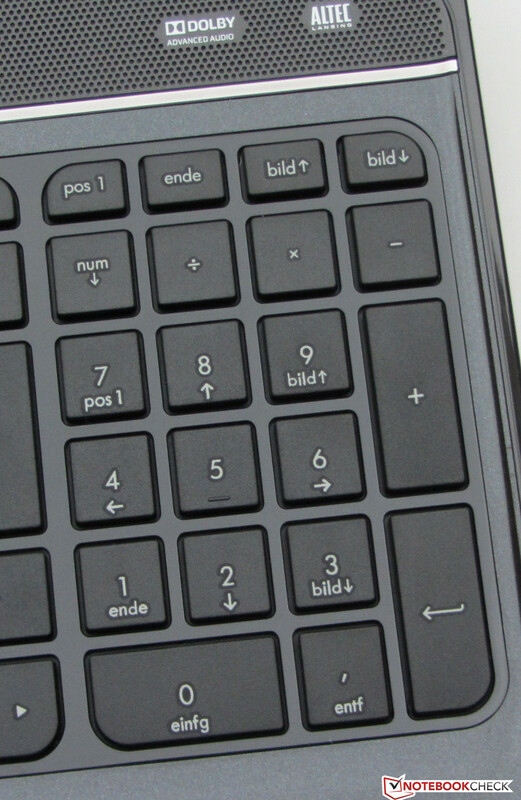 The main keys of the Chiclet keyboard are 15 x 15 mm and have a medium stroke depth and a crisp pressure point. The area above the DVD burner flexes when typing, while the rest doesn't under significant pressure. There is a small manufacturing flaw in front of the space bar. The keyboard does not sit flush with the case here. Overall, the keyboard is decent. The WiFi, Mute and Caps-Lock keys each house a small indicator LED which is a very useful feature. 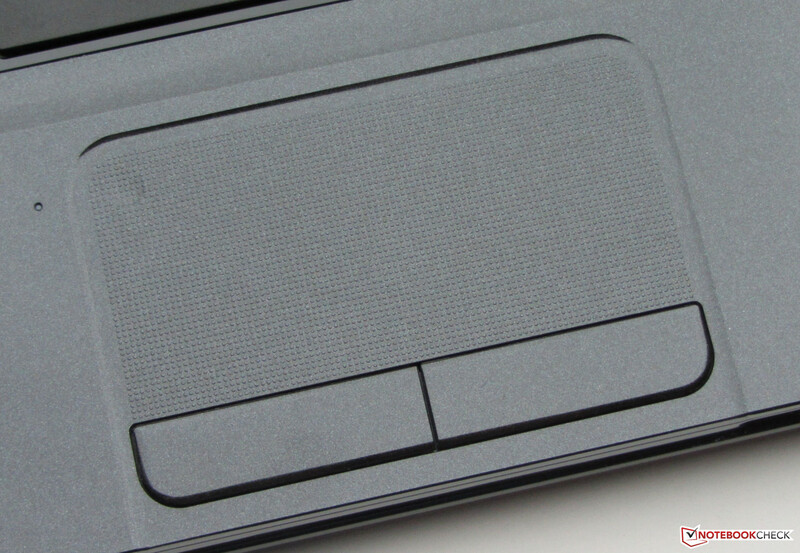 The Synaptics Touchpad is slightly recessed into the palm rest. Its surface of 9.6 x 4.6 cm is sufficiently big for multi-touch gestures, which can be enabled and disabled individually in the configuration menu. 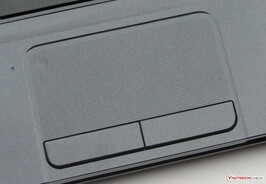 The surface of the touchpad textured which does not have a negative impact on the gliding traits. The touchpad can be switched on and off by double tapping the small depression in its upper left corner. Its two mouse buttons have a short stroke length, and crisp, clearly audible feedback. 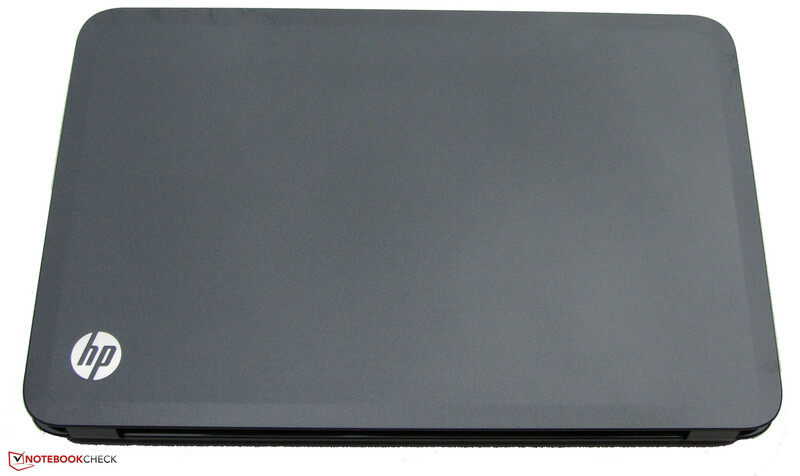 The Pavilion is equipped with a glossy 15.6-inch display with a native resolution of 1366 x 768 pixels. HP does not offer other options. The average brightness of 189.8 cd/m² is average, but the two competitors do not perform any better. The display of the Aspire (177.6 cd/m²) is slightly dimmer than the HP's while the Samsung's (207.4 cd/m²) is a little bit brighter. While the display is standard fare in terms of brightness, its contrast (690:1) and black value (0.3 cd/m²) are very good. Much more expensive laptops frequently do not achieve such good values. The display can neither completely cover sRGB nor AdobeRGB, but sRGB coverage is pretty good. Low brightness and the reflective surface actually prevent outdoor usage. Thanks to the high contrast, the displayed content can definitely be recognized, but you should avoid bright areas for getting any work done. Again, the display is only standard fare in terms of viewing angels. Any movement in the vertical direction will quickly have a negative impact on the image, while the viewing angles are better in the horizontal direction. 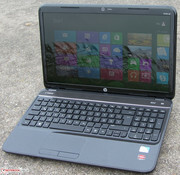 With the Pavilion g6-220sg, Hewlett Packard deliver a multimedia notebook for frugal customers and is currently available for about 480 Euro ($630). Its performance suffices for the usual tasks and can also run 3D games smoothly. While our test model is only available in this particular configuration, HP also offers a lot of other Pavilion g6 models, some of them with AMD processors while others with Intel CPUs. The Pavilion g6-2200sg is equipped with an Intel Pentium B980 processor, a dual core Sandy Bridge CPU with a clock rate of 2.4 GHz. Unfortunately the CPU does not use Intel's Turbo technology. As the CPU constantly runs at full speed in the Cinebench tests, it performs as expected. Furthermore, the HP notebook bests Samsung's NP355V5C-S05DE (AMD A6-4400M, AMD Dual Graphics) in CPU-intensive tests because of its faster CPU. But both of them are outperformed by Acer's Aspire V5-571G (Intel Core i5-3317U, Nvidia GeForce GT 620M), which uses the fastest CPU of the three. 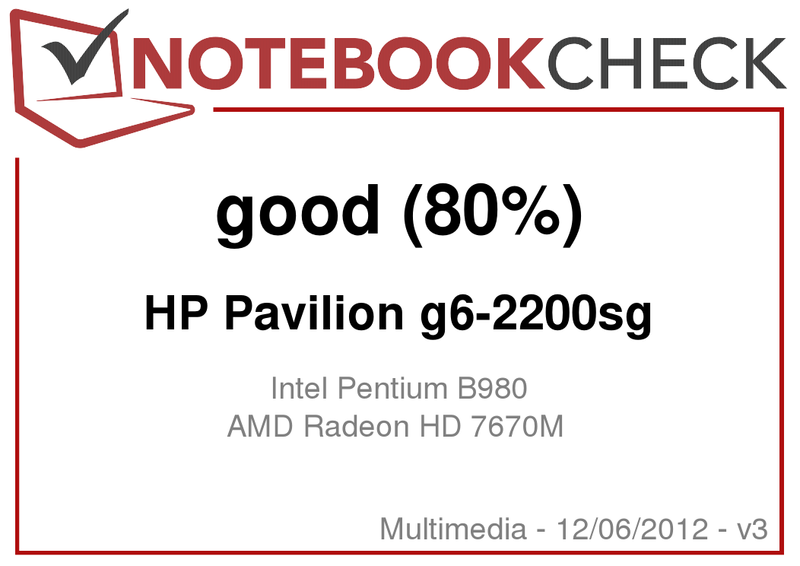 But the Pavilion performs better than its competition in the GL tests as the combination of Pentium B980 and the HD 7670M GPU is more powerful than the CPU/GPU combinations of the others. The computer system runs smoothly without stuttering and the results of the PC Mark 7 benchmark meet our expectations. The Pavilion's performance falls between the Acer Aspire V5-571G's (Intel Core i5-3317U, Nvidia GeForce GT 620M) and the Samsung NP355V5C's (AMD A6-4400M, AMD Radeon HD 7520G + HD 7670M), but the results of the three laptops do not differ by much. HP equips the Pavilion with a Hitachi Travelstar Z5K500 hard drive (500 GB, 5400 RPM). CrystalDiskMark reports a read rate of 84.71 MB/s and HD Tune an average transfer rate of 80 MB/s. Both values are more than fine for a 5400 RPM hard drive compared to slower hard drives often found in cheap notebooks. Two GPUs work inside the Pavilion g6-2200sg - Intel's HD Graphics (Sandy Bridge) and AMD's Radeon HD 7670M. The Intel GPU supports DirectX 10.1 and runs at a clock rate of 350 to 1150 MHz while the graphics card from AMD is mid range, runs at 300 to 600 MHz and supports DirectX 11. The two GPUs do not work together, but the one which is more appropriate for a particular task is selected. At the end of 2012, Nvidia's graphics switch (Optimus) still works better than AMD's. We had to manually configure that the Radeon GPU should be used before running benchmarks and games. Otherwise, the system nearly always used the CPU from Intel. Especially inexperienced users could get annoyed at games stuttering. The results of the 3D Mark benchmarks are as expected. 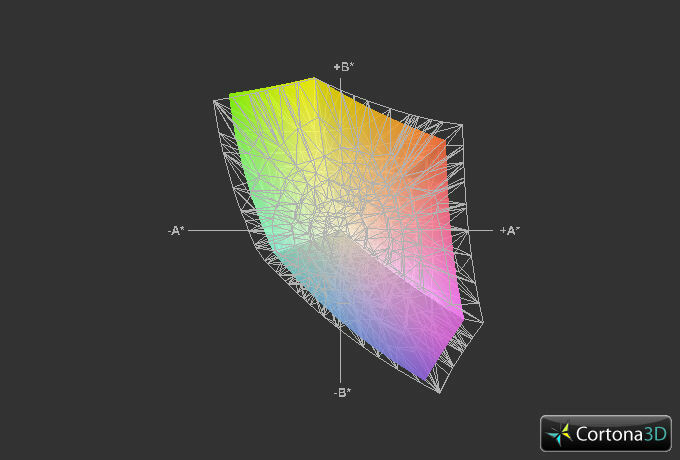 If all 3D Mark versions are taken into account, none of the notebooks achieves a clear victory. 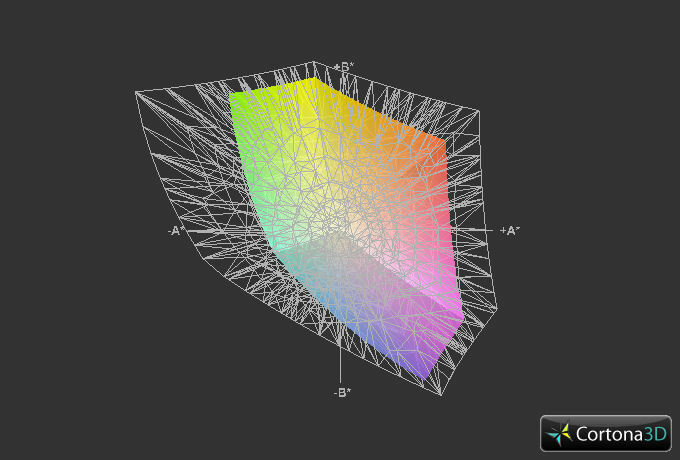 On the contrary, their 3D-performance does not differ much. Thanks to its Radeon GPUs working together, Samsung's 15.6-incher wins the first place in 3D Mark 11. As the the impact of the CPU on the result is lowest here, the computer with the weakest CPU can score points. The Pavilion g6-220sg is definitively gaming capable. It can even run modern computer games in medium to high graphics quality at its native resolution. The laptop cannot achieve decent frame rates in brand new and very performance demanding games like Hitman: Absolution. Although we explicitly selected the Radeon GPU, we cannot exclude that the GPU switch did not work in the Hitman benchmark. We faced a similar problem with F1 2012, which refused to start with the active Radeon GPU. Fortunately the Pavilion runs quietly while idle. The noise level amounts to 31.3 to 32.6 dB here. When using the DVD drive the noise increases to 35.6 dB. Unfortunately the clacking of the hard drive is quite audible time and again. 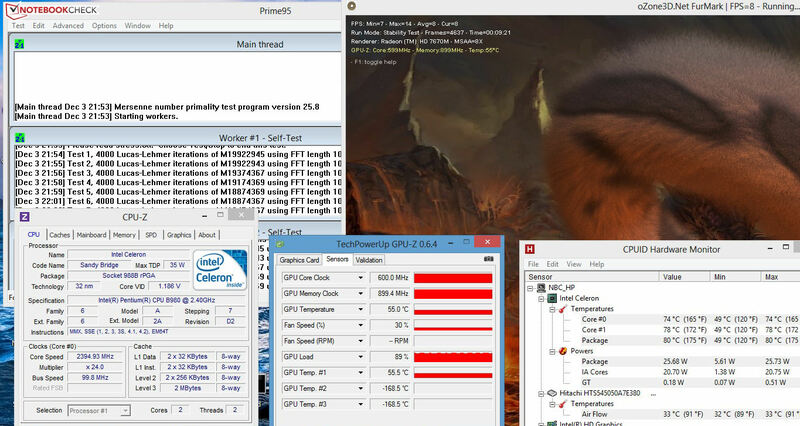 Under full load (stress test: Prime95 and Furmark), the fan accelerates and the noise reaches 48.7 dB while the g6-2200sg works at a tolerable noise level of 38.1 dB under medium load (3DMark 06). The noise of the Aspire V5-571G and the Samsung NP355V5C-S05DE, which are only significantly quieter under full load, is on a similar level. Regardless of the load, the surface temperatures are fine. 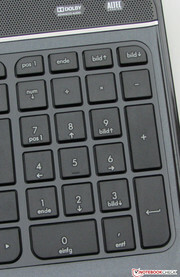 While idle the temperature only increases to 30.1 degrees Celsius on a single area (under the touchpad). Under full load (Prime 95 and Furmark run together) the temperatures only rise moderately to 21.7 and 40.8 degrees Celsius. So, the laptop can be used on the lap in any case. Acer's Aspire V5-571G and Samsung's NP355V5C cannot compete with the HP here and develop more heat. During our stress test (Prime 95 and Furmark run for at least an hour) CPU and GPU run at full throttle on the mains. While CPU speed is not reduced while on the battery, the GPU's clock falls to 400 MHz and the CPU temperature levels off at 80 degrees Celsius. (+) The average temperature for the upper side under maximal load is 27.1 °C / 81 F, compared to the average of 30.9 °C / 88 F for the devices in the class Multimedia. The stereo speakers of the notebook sit above the keyboard beneath a perforated grille. "Altec Lansing" and "Dolby Advanced Audio" stickers suggest decent sound and this is not completely wrong. The speakers sound loud, but lacks bass. Speech is clearly audible and watching films is indeed possible without external solutions. Similar to Samsung's computer, our test device needs about 9.2 and 13.9 Watts while idle. Unsurprisingly, the Aspire V5-571G is significantly more frugal than its competitors, as it is equipped with a frugal ULV processor. Under medium (3D Mark 06) and full load (Prime95 and Furmark) the power consumption increases to 50 Watts and 69 Watts respectively. The Samsung (64.6 W and 67.1 W) is close to the Pavilion under full load. But, thanks to its frugal components, the Aspire (42.1 W and 49.5 W) performs better again. In idle mode our test sample achieves a battery runtime of 6:03 h minutes, while the Acer already shuts down after 5:43 h and Samsung's NP355V5C-S05DE runs for 7:05 h. The maximum battery life is recorded by means of the Battery Eater Reader's test with energy saving profile, lowest display brightness and disabled WiFi-modules. Under load the notebook achieves a minimal battery life of 1:21 h, which is similar to the competitor's (Acer: 1:32 h, Samsung: 1:23 h). The Battery Eater Classic Test is used for this test with highest display brightness and enabled WiFi modules. In our WLAN test the HP achieves a runtime of 3:48 h (Acer, Samsung: 3:15 h). Here our looping script simulates internet surfing by automatically loading new web page with different content every 40 seconds. 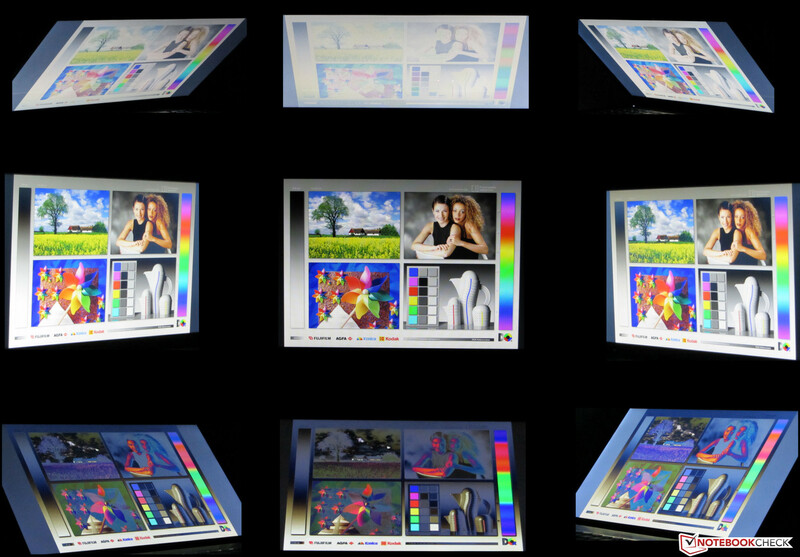 During this test the display brightness is set to about 150 cd/m² and the energy saving profile is active. 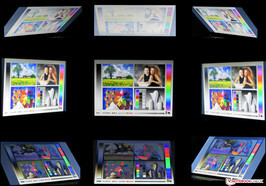 The DVD test, run at maximum display brightness and with energy saving profile (or higher if the DVD does not play smoothly) already ends after three hours. But the competitors have even shorter runtimes in this scenario (Acer: 2:42 h, Samsung: 2:22 h). The battery runtimes of the Pavilion and the Samsung notebooks can be easily compared to each others as their battery capacities are nearly on par (HP: 47 Wh, Samsung: 48 Wh). On contrary, the Acer is equipped with a smaller battery (37 Wh). 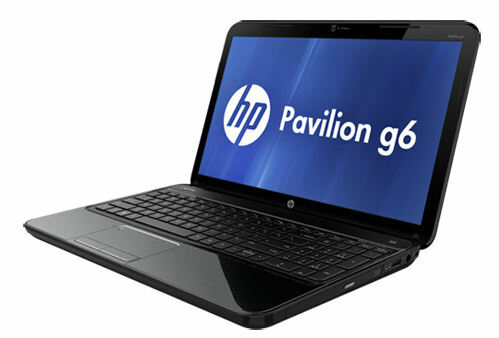 The Pavilion g6-2200sg is a good deal and a decent notebook for all looking for a cheap general purpose notebook. It delivers fair system performance, which suffices for most users, works quietly under low load and comes with a contrast-rich display. Furthermore, the Pavilion is also interesting for gamers who do not like to spend 800 to 1000 Euro ( $1050 to $1300) for a fancy gaming computer. The cons of the 15.6-incher are a short warranty period of only 12 months, the lack of GigaBit Ethernet and the inconvenient graphics switch. Acer's Aspire V5-571G is interesting for a user looking for an especially thin and cheap device. We also recommend the Aspire if maximum CPU performance is required while we suggest the Samsung NP355V5C-S05DE if a long battery life and/or a matte display are buying criteria. The key size is comfortable. ...and rated up to 90 watts. ...and has a capacity of 47 Wh. The maintenance cover is only held by a single screw. 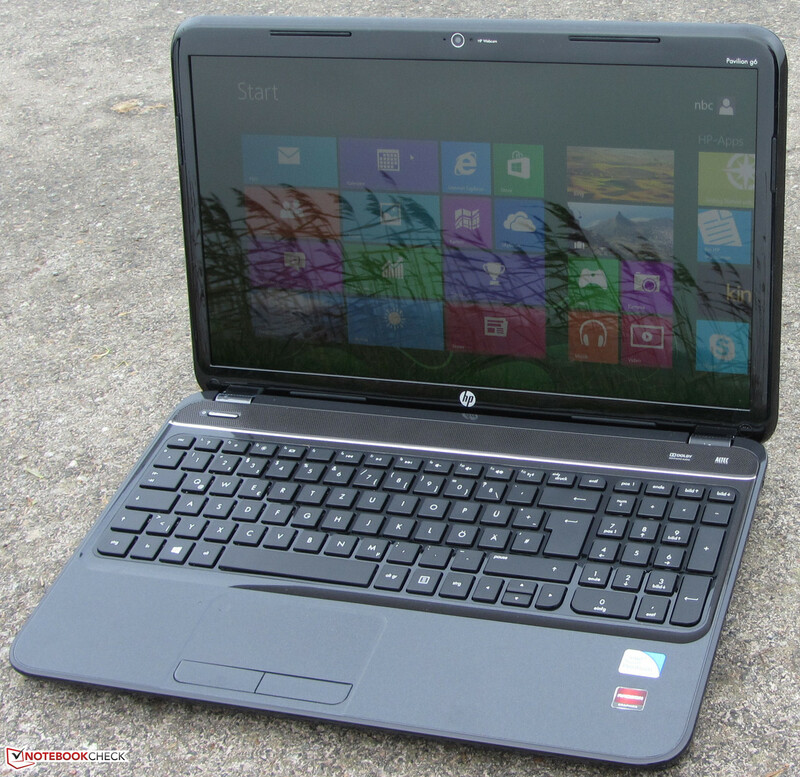 HP offers decent gaming performance for little money with the Pavilion g6-220sg.